The river downstream from Town Bridge in the centre of Guildford sees the beginning of the Wey Navigation built over 350 years ago. Representing the first British river to be successfully canalised for commercial traffic, the Navigation brought prosperity not only to the town but also the whole region. Combined with the younger Godalming Navigation upstream the waterway enabled barges to travel the twenty miles to the Thames. This opened up huge trading opportunities, not just with London, but with the whole country and Europe beyond. “It is good to have pets, and I have several on the boat. My favourite is felix the fake cat (honestly he is lovely), who is accompanied by quite a few spiders. My other pet is from the diptera family, is small, and has a rather high pitched whine. I thought he might devour me but as he didn't we built up quite a bond - until last night of course. The pet known as Mosquito is known to transmit diseases such as malaria, yellow fever, dengue, filariasis and encephalitis. For me, I am suffering from the 'itch'.... I have mosquito bites on the soles and side of my feet, behind my ear and on my face. I am practicing my murderous swat and pinch as I write. Not all pets are good." “The late Prime Minister Harold Wilson's son Giles, we learn, drives trains from London to Guildford and Dorking. This is no ignoble vocation. "Through those two stations, with the moderate warmth of intermediate technology, pass seven and half million passengers a year. Retired from teaching, aged 58, Mr Wilson is far better employed driving trains than watching daytime television. The sinister killing machine that is the sparrowhawk has a good many stealth strategies to ensure that it never goes hungry. One is where the bird will conceal itself out of sight of a target group of sparrows, whilst it works out the best line of attack. Once in the air the sparrowhawk will follow one strategy of flying extremely close to the ground, using vegetation as cover. Locking on to one member of the flock, the hawk will only launch its high-speed attack at the last possible moment. Should the hapless sparrow try to escape the hawk follows precisely every attempt of its prey to duck and dive, and invariably hits home. "Both (Rivers Wey & Thames) keep complaining that I (River Mole) spend too much time on my own and avoid towns, whereas they like to be sociable and enjoy entertaining. That’s something I hate because I have always been very shy and prefer to be on my own, anyway. In any case, avoiding towns is a good thing now because I worry that one day there won’t be any green space left in the southeast because it will all have been built over as London expands, they build more and more houses, as well as a new runway at Gatwick because more and more people want to fly. "It just happens, when it rains too much, rivers overflow, we can’t help it. I can’t control the weather any more than they can. Wey, meanwhile, did Guildford, spilling into the basement of the main department store. They are now having to sell everything off for virtually nothing – might be handy for Christmas shopping, then." The Secret Diary of the River Mole by River Mole. "The Drummond (Guildford pub on Woodbridge Road) closed for a while and then reopened completely redorated and quite possibly new ownership(?). Even before we entered the pub we were thinking "What have they done? NNNNNNNOOOOOOOOOOOOO"
First thing is the sign of a British Bulldog, I know it shouldn't but it makes you think your about to enter a BNP lair. 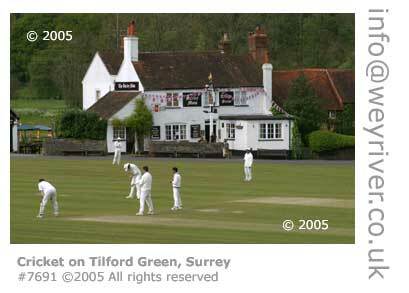 Then there's the fact that the whole pub is painted brown. Anyhow we still ventured inside before the bus. Now the brown & red decor made us think we've accidently walked into a brothel, arghhh. "Neville Simmons celebrated his 75th birthday, in fine style at the weekend, with a 130-mile canoe relay and a party.There cannot be many 75-year- olds as fit as Neville, this is despite having had major surgery for cancer in February, and he proved his fitness by paddling a total of 20 miles in relay, which began at Wey Kayak Club in Guildford, and finished at Cropredy (Oxfordshire). "At Wey – Neville's first kayak club – his old friends were out in force to see him off, and there was anexchange of vests between the clubs. Neville, and a flotilla of Wey paddlers, led off the first leg of the relay, which continued up the Wey Navigation and onto the Thames, with paddlers, young and old, taking the various legs. "I took myself off to Stoke Bridge (just north of Guildford) for a days paddling. My usual launch site next to the pub was closed off with a newly erected fence so I moved 100 yards upstream to the site of the Wey Kayak Club and launched from there. 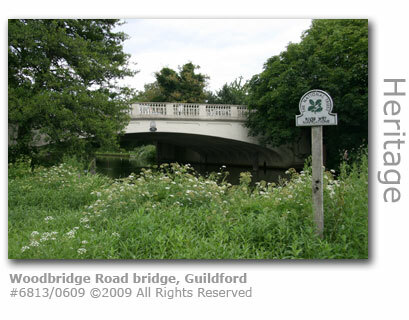 "I headed upstream past the backs of houses and under the A3 (Guildford Bypass) bridge - it may look peaceful but the traffic noise is similar to Heathrow Airport. Shortly after I came to Dapdune Wharf the local headquarters of the National Trust who own and operate the River Wey Navigations. From here the river runs behind light industrial sites (the river is still tree lined so if you squint and concentrate very hard you can pretend they are not there) until they give way to offices and shops (tradesmens entrances only). 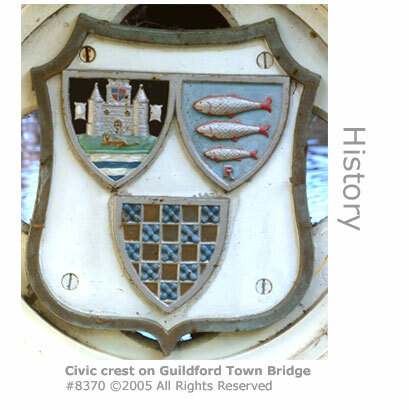 "Several busy road bridges mark the centre of Guildford after which Guildford turns to face the river with first the Electric Theatre (it used to be the Electricity Works) and then several cafes and pubs. Here you will find one of very few surviving examples of treadmill operated cranes excellently preserved (thanks to the National Tust). "Shortly after I came to Town Mill and Millmead lock where I portaged across the lock island - I hate portageing - especially in a Pelican and on my own!! While I had enjoyed the trip so far, from this point it got even better. With parkland on the right and the buildings on the left giving the river their full attention I left Guildford and entered open country. "A mile on the river seems to fork. The navigation and St Catherines Lock is to the right but I went left, follwing the original course of the river as it meanders through woods and meadows with no tow path. At one point a fallen tree almost blocked the way (Wey?) but there was just enough room to limbo under its branches. found somewhere to stop for lunch before continuing to Riff Raff Weir where the river rejoins the navigation. "I may have mentioned that I hate portageing, so I retraced my steps to the junction where I took the navigation to St Catherines Lock. The Surrey Advertiser offices in Stoke Mill on the river were turned into (June 2007) a set for a strictly private film that is unlikely ever to be seen by members of the public. Filmed by an ITV production crew the scene starring Soldier Soldier star Robson Green as a jazz-playing investigative reporter was part of a spoof film to be presented at the leaving dinner for outgoing controller of drama for ITV Nick Elliott. In the style of a trailer the story follows a string of ideas that the chief would never have considered commissioning during his career. 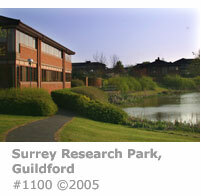 Additional scenes were filmed on the banks of the River Wey and on campus at Surrey University in Guildford. "After about half a kilometre we passed a favourite spot of ours, and got stuck. There is a statue next to the White House pub, on a piece of grass on the opposite bank of the river from the Yvonne Arnaud Theatre. It depicts a rabbit scurrying for its burrow, hiding from two girls. The girls are lying on the grass, reading from a book open at chapter 1: Down the Rabbit Hole. "The book is of course ‘Alice in Wonderland’, written by Lewis Carrol, the famous writer and mathematician who used to live in Guildford. Poor Lia and Emma had to line up for a photo shoot first, but they’re now at the stage where they hardly grimace anymore when I pull out my camera. Lia took a lovely picture of Emma and me, and even Emma tried her hand at a photograph - quite successfully! "We had enjoyed a really peaceful night at the secure moorings at Dapdune Wharf, it is a place anyone coming here should visit, we woke up needing a cuppa before getting out of bed. Breakfast was Bacon Rolls for a change before setting off at 9.15am. "Some of the old mill buildings are really beautiful; it is nice to see they have been preserved and are now apartments. So often these historic places are flattened for a new, modern building. I prefer the old ones when it is possible to save them. "Once out of Guildford we were into some stunning countryside and met up with the local canoe club, all out in force practicing. Not everything was as straightforward as expected; we encountered a very low bridge (at Broadford), not helped by the fact that the navigation is running a little high. So it was down with the mast, off with the chimneys, Buckby cans and engine chimney. Keith and I had to duck low, but we made it through ok, with gongoozlers watching in amazement. It seems that they very rarely see a working boat, because we have been videod, snapped with all the latest cameras, and asked every question under the sun. We saw the junction with the Wey and Arun Canal as we headed on towards Godalming. 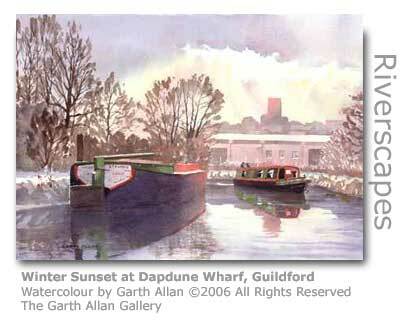 (BACK IN GUILDFORD) "We were already for the off at 9.30am and tried to leave the Dapdune Wharf mooring, but Hadar was stuck fast. It appeared that the level of water had dropped over night and we were on silt. But with the help of two guys working on the renovation of one of the River Wey Barges we managed to push and pole Hadar into the flow of the river and we were off. 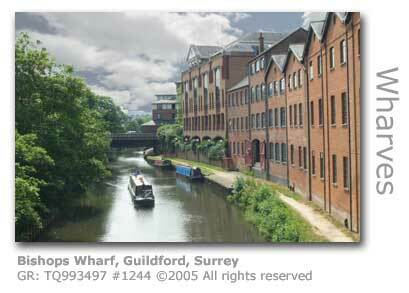 "Today we've been to Guildford where the Boat Gathering was being held on the River Wey. The first event of the afternoon was the Lions Raft Race, and there must have been a couple of dozen competitors with rafts of varying degrees of ingenuity. The theme was children's television. "We walked down the towpath following the rafts, but decided to turn back before the finishing line. It was quite a long way, and some of the crews (particularly the ones who were paddling rather than peddaling) looked rather tired and were going slower and slower. "Back at Millmead, the decorated boat parade was about to begin. I don't know who took the official title but our personal winner was Thomas the Tank Engine, complete with turning wheels and smoke coming out the chimney, with Thunderbird 2 coming a close second. "The Guildford boat gathering proved to be a great event. At lunchtime we walked up to see the start of the annual raft race. "Quite a crowd gathered to see the dozen or so craft that had been built for the race, some of them quite amazing. Boats and costumes were in accordance with the published theme of children’s TV programmes, so we had Postman Pat, several Thunderbirds and an excellent Flintstones. The actual race worthiness of the craft was very variable and the poor Smurfs team had their boat disintegrate within thirty seconds of launch. "It seems to be the tactic before the start to give your opponents a good soaking and there was a huge water fight. Those with mere water pistols were soon outgunned by water bombs, some launched by impressive catapults. The most aggressive team however resorted to the crude expedient of using buckets to chuck a couple of gallons at a throw over the enemy. I’ve no idea who won the race, they all paddled off down the river and we returned then to Herbie to watch the pageant of decorated narrowboats and cruisers (same theme). 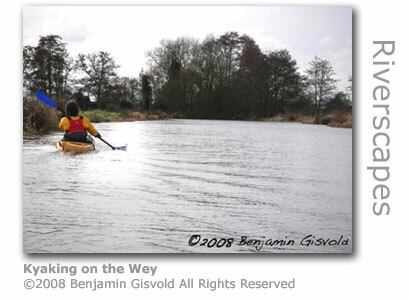 "We went out kayaking on the Wey again today - even though it was raining. And I was impressed by the number of people we met on and alongside the river - also disregarding the rain. 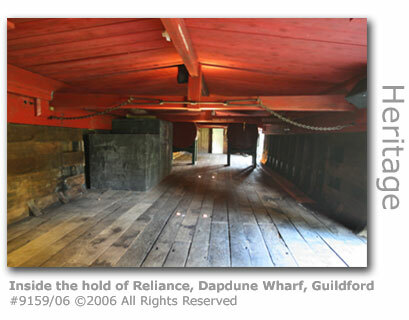 "As part of this half term’s topic 'Row, row your boat' Year 6 visited Dapdune Wharf in Guildford. Now managed by the National trust, the wharf was once an important trading link to London. Corn, timber and even gunpowder were loaded onto barges which travelled up to Weybridge and then onward up the River Thames. Coal was the cargo for the return leg of the trip which lasted a total of 3 days. "An exciting day of activities centered on the River Wey. Year six learnt about the Edward’s family barge business inside the cargo hold of one of the last surviving river barges The Reliance. 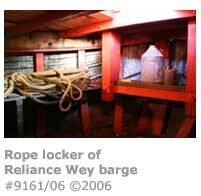 The importance of pulleys to off load the heavy cargo soon became apparent when trying the hands-on exhibits.
" As part of our first project during Semester ...we embarked on a field trip along a section of the River Wey with the other levels studying landscape architecture at Kingston University, comprising of roughly 60 students. The aim of the field trip was for us to develop experience, understanding and appreciation of time and the specific elements which are unique to the environment of life on the canal. Over the four days of the trip we would receive talks from professionals detailing the history, developments, projections and briefs of the various projects along the Wey and Arun canal which were of interest to our assignment. "Arriving early we took a stroll around the town, having some lunch before heading back to our allocated boats at 2pm for an operating demonstration. The gentleman providing our instruction was a character called Terry, who I think scared some of the students with his no-nonsense approach, but was full of stories and information concerning the boats, the canal and its history that we all left with a smile. "Once we had received our orders we made our way to Dapdune Wharf a couple of miles north of Guildford to rendezvous with the twelve other boats within the group and moored up for the night. Within our field trip group was a collection of different sized boats ranging from 4-12 births. Each boat was nominated a captain and a first mate, with the crew made up of 1-3 year degree, diploma and masters students. 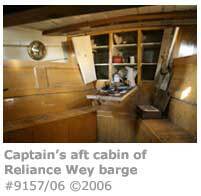 "I was nominated the captain of the Frensham a 10 birth canal boat with a motley crew of fellow students. After a few teething problems with the boats steering system, narrowly missing the bank and getting a mouthful of leaves, we managed to make a relatively gaff free mooring in front the other assembled boats.
" Up nice and early with a cold shower and a bowl of Frosties. We all met on the bank outside the Dapdune Wharf Visitor. After a brief tour we all met for a talk by John Gibson, the navigations manager for the National Trust who provided a brief history of the waterway, an explanation of the trusts works concerning the waterway, its future goals and the particular difficulties it faces to help us with assignment. Once the talks were over the individual crews met up to begin their day of sailing down to Stonebridge Wharf in Shalford through Millmead and St.Catherine’s Lock. In reflection this was the best part of the trip, experiencing the tranquility, slow pace and beauty of the countryside. After the Wey Navigation was opened in 1653, the traffic on the Wey grew rapidly with barges over the ensuing three hundred years transporting everything from timber, corn, flour and coal; gunpowder, chalk and bark for tanning; paper; sugar, oil cake and artificial fertilisers; rags for papermaking, barrel-hoops and even surplus fighter aircraft at the close of the First World War. The opportunities for commercial gain were not overlooked by numerous industries at the heart of which were the water mills producing an incredible array of products and providing a fascinating insight into the demands of the nation over the centuries. The Wey Navigation, and the younger Godalming Navigation, were relinquished from private ownership and entrusted to the care, in the case of the Wey Navigation, of the National Trust in 1964. The unstinting efforts of the Trust and an army of dedicated volunteers will ensure that the navigation will remain open to be enjoyed by future generations in perpetuity. Their task is greatly aided by the fact that today the navigation is totally self-funding and has never had to turn to The Trust for financial support. 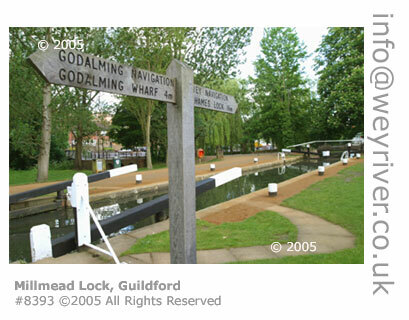 Both the Wey Navigation and the Godalming Navigation were designated a Conservation Area in 2002. The National Trust, alongside commercial and club ventures, actively promotes the use of the river for leisure activities. All manner of boating activity including canoes and rowing boats, a horse-drawn trip boat, and narrowboats hired and privately owned, use the waterway throughout the year. It is also possible to walk or cycle the full length of the navigations from Godalming to Weybridge with only two minor interruptions, and so casual walkers, serious ramblers, joggers and cyclists are a common sight along the towpaths. The Projects & Conservation Team of the Trust chairs the River Wey Group, which consists of a highly motivated group of volunteers and other interested parties, meets bi-annually to agree and co-ordinate projects to preserve the river and its environs. This beautiful blend of man-made and natural heritage looks certain to be preserved for posterity. 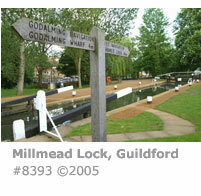 It was not for almost another one hundred years that the upstream extension providing navigation from Guildford to Godalming was constructed as the Godalming Navigation in 1764. Each barge that used the waterway was either horse-drawn, or manually hauled by bow-haulers which required a substantial towpath to be built, a legacy which provides walkers and cyclists today with a virtually uninterrupted run the full length of the Navigation. The wharves serving the river were constantly busy with often more than sixty barges working the Navigation at any one time. A service industry dedicated to the bargemen and their families and horses thrived, and included a blacksmiths forge that was established at Worsfold Gates, a replica of which has been installed in Haslemere Museum. Over the ensuing centuries river carriers added oil cake and artificial fertilizers to their cargos. The river continued to provide a safe conduit for shipping gunpowder from the Chilworth Powder Mills until after the Great War. The Stevens’ family, trading as Stevens & Sons, were the dominant river carriers on the river later in the Navigations' history, and they were instrumental in keeping the navigation open even at a time when the railways were rapidly transforming the way goods and people were transported around the country. The family were the last owners of the Wey Navigation until a son, Harry Stevens, relinquished the canal and entrusted its safe-keeping in perpuity to the National Trust. 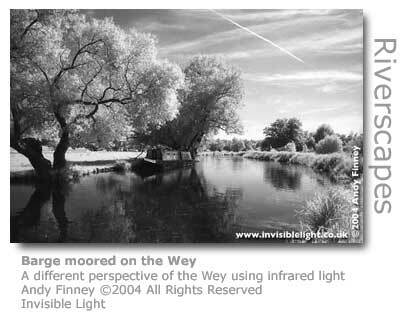 The Wey forms part of a comprehensive network of navigable waterways crisscrossing the English countryside. If you’ve got a few months to spare you could navigate from Godalming at the head of the navigations and reach a network of 2,000 miles of navigable waterways. Apart from the river’s natural course running into the Thames, this connectibility was deliberately improved at a time when water transportation was vital to the economy. The Basingstoke Canal was dug in 1796 and was connected to the Wey. An Act in 1813 three years later led to the construction and opening of the Wey and Arun Junction Canal providing a connection to the River Arun in Sussex. This for a time opened up an inland route from London to the south coast. 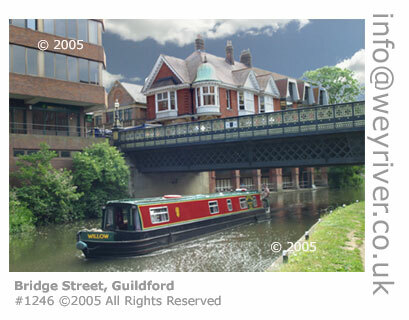 The extension of the railways from Woking to Guildford in 1845 gradually reduced the volume of river traffic, but it was not until 1958 that the passage of the last barge from London to Guildford was recorded. 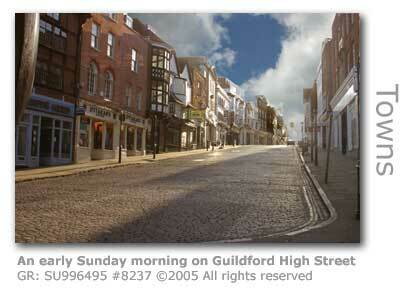 The busy market town of Guildford was a natural focus for commercial activity along the river. Much of the barge traffic was serviced by wharves along the banks of the navigation running through the town. 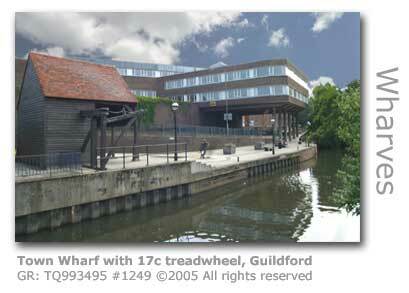 One of these, Town Wharf has been preserved by the National Trust complete with its 17th century crane and treadmill. 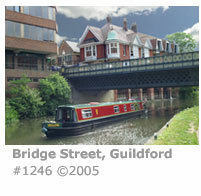 Guildford was once the centre of barge construction for the distinctive Wey Navigation barges. These were built at Dapdune Wharf (GR: SU994503) which has been fully restored by The National Trust. In the 19th century Guildford’s industry was dominated by corn trading greatly aided by the rich farmland all around, the town’s perfect position straddling the main thoroughfares to London and the Channel ports, and the presence of many corn mills operating along the Wey Valley. The town also had a large iron foundry and paper mills. Until the time of Elizabeth I, the processing of wool and the manufacture of cloth provided chief employment in the town. The pre-eminence of the trade was largely down to the invitation by Edward III for Flemish weavers to settle in the town which brought great prosperity not just to Guildford but other settlements along the Wey. A town proud of its heritage and always ready to promote the endeavours of its inhabitants, Guildford organises a month long Summer Festival which features everything from arts and music to history and sport. One of the more eccentric fundraising events naturally centres on the river, and this involves an organised spectacle of raft races up and down the Wey. Organised by the Guildford Lions, part of an international organisation dedicated to fundraising for local needy causes and founded in the town 38 years ago, the race includes the obligatory outlandish fancy dress and sinkings. The July 2009 Lions Charity Raft Race saw the largest flotilla yet and the event raised over £9,000 for local charities. Thirty-four extraordinary craft set off from Millmead and followed a one-and-a-half mile (2.5km) course downstream to the Woking Road Bridge. The theme of blockbuster movies guaranteed a colourful and imaginative turnout of hand-made craft including rafts inspired by Castaway, Top Gun, Batman and an extremely obscure Pirates of the River Wey. Teams included those from Surrey Fire and Rescue and South East Coast Ambulance service risking all on vessels assembled with ladders, old barrels, timber and other recycled material. The winning craft completed the course in 37 minutes and 15 seconds. A more sedate parade of vessels is also featured in the Guildford Festival decorative boat pageant which commemorates the long and historic relationship between the town and the Wey. The low water conditions following an exceptionally dry winter resulted in the cancellation of this waterborne parade in 2005 for fear of the abnormally high use of the Navigation locks draining too much water from the river. Behind the renowned Yvonne Arnaud Theatre and straddling a large man-made cut is Town Mill (GR: SU997494) an imposing brick structure towering over the expansive mill pond that laps against the foundations of the Debenhams Store. Although there is no mention of a watermill on this site in the Domesday Book, local historians believe that mills were operating here well before the Norman Conquest in 1066 to cater for the town’s burgeoning population. In the late Middle Ages fulling mills on this site were producing local woollen cloth, part of the process requiring water-powered hammering to produce a smooth surface. The Poyles paid two shillings in 1295 to have the embanked leat constructed. This cut still feeds water through the Town Mill to this day and can be seen running alongside Millbrook just before the entrance to the theatre. In 1439 Poyle’s Mill consisted of two corn mills and two fulling mills, all in actual fact operating within the same building as the ‘mill’ then referred to an individual pair of millstones. Henry Smith a local philanthropist passed ownership of the mills to a Trust in 1624 that used the profits they produced to provide for the poor of the town. Town Mill was rebuilt in 1649 providing four pairs of stones for milling corn, representing a considerable business at the time. 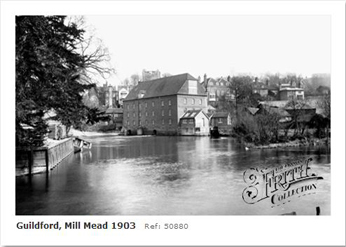 Town Mill was to provide another major contribution to the town when by 1701 William Yarnold had installed pumps in what was now a fulling mill to supply public water to the citizens. Pipes were made from hollowed out elm logs and pumped into a reservoir at the base of Pewley Hill (GR: appTQ005490) on the other side of Millbrook and which used a gravity feed to supply the town. The mill pond provided additional income through a fish farm, a common practice of the time. By 1713 the mill had been converted back to grinding corn and almost 60 years later had been extensively refurbished in brick. 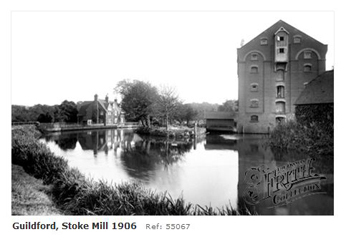 By 1852 the mill looked pretty much as it does today. With the wholesale decline of flour milling along much of the Wey from the late 19th century due to the introduction of highly efficient steam powered mills, such as that at Coxes Mill on the Wey near Weybridge, Town Mill finally closed and was converted completely to a water pumping station by Guildford Corporation. 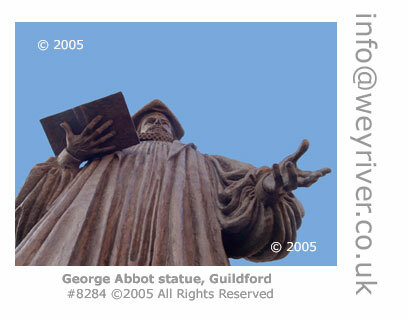 In September 2006 the Hydro Turbine Project for the town was formally opened by the Mayor of Guildford. Work to install the new 35KW turbine took eight weeks and the savings to the town through supply of electricity will deliver returns after the turbine has been running for ten years. The energy produced by the turbine will be the equivalent of that consumed by 50 households (260,000 kWh pa) and is delivered into the local network. 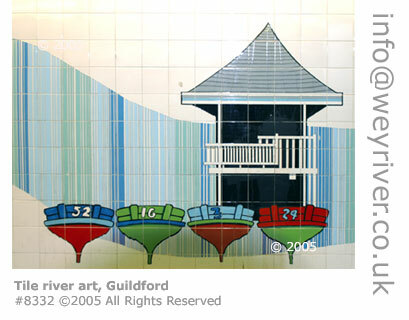 The project effectively placed Guildford as the first local authority to own a small-scale Hydro in the south-east of England, and was partnered by the Yvonne Arnaud Theatre with Guildford Borough Council with partial-funding from a grant from the Government's 'Clear Skies' programme (1). 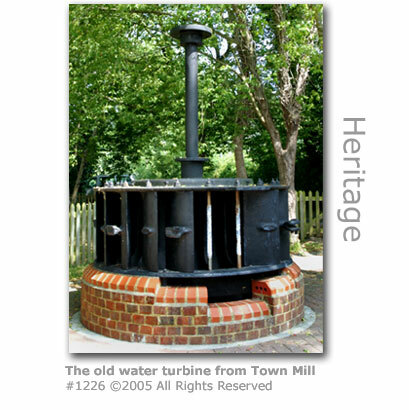 The new turbine weighing 6 tonnes is housed in the Toll House which was built as an extension to the original Town Mill in 1851, and where the water turbines for the pumping station were installed in 1897. These fell redundant when electric pumps were installed in the Thames Water site opposite the mill. The original turbine was removed and is preserved at Dapdune Wharf. The project has been recognised through a number of prestigious awards since its completion. These include a Green Apple Award (2007) from the Green Organisation (2); the Thames Valley Environmental Project of the Year 2007 from the Institute of Civil Engineers; Energy Saving Award 2007 from Drives and Controls Magazine (3); Highly Commended at the Sustainable Communities Awards 2007; and winner of the Wind & Water category at the South East Renewable Energy Awards 2006. (2) The Green Organisation is an 'independent, non-political, non-activist, non-profit environment group dedicated to recognising, rewarding and promoting environmental best practice around the world'. Installation of the hydro turbine required that the river above and below the mill was dammed and pumped out, and this had to be timed to miss the fish spawning season. An exercise to rescue trapped fish also proved successful. By September 2009 the turbine had clocked up a total of 500,100 kilowatt hours (kWh). Guildford Borough Council estimates that on average the turbine should generate 260,000 kWh per year, on which basis the investment payback period for installing the turbine is around 10 years. Today the mill is used by the Yvonne Arnaud Theatre for rehearsals and to house its highly accalaimed second stage, the 80 seat Mill Studio which opened in 1993 and provides a showcase for amateur as well as professional performances. One of the first mills in Guildford was sited on Westyne, (GR: SU994494), then a small island by Town Bridge by St Nicolas Church, in the 13th century. The channel separating the island from the church was filled in during the 18th century and the White House public house now stands on the site. Millmead, the area occupied by the car park in front of The Britannia public house was as a ‘mead’ used for grazing, and the name surviving until this day refers to the ‘mead by the mill’. Fullers also used the mead for drying their cloths. There is a small but delightfully kept public garden in Millmead, the Westyne Gardens, and erected here is an intriguing sundial. 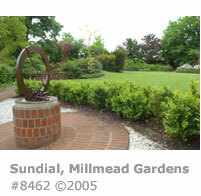 The sculptor, Joanna Migdal, was in June 2005 given the considerable accolade of being awarded by the British Sundial Society the annual Best Sundial Made in Britain by a Professional Maker. 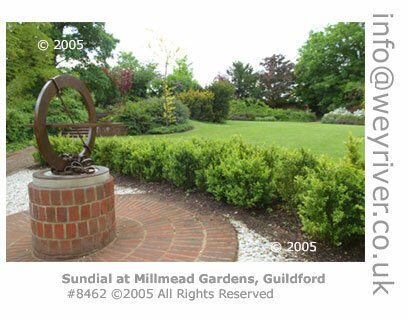 Having been supported by the Borough Council, Surrey Chambers and 30 local business benefactors Migdal created the sundial to mark the millennium. The sundial rests on a plinth and around the base of the sculpture is a chain representing Guildford’s historical connection with the River Wey. If you’re passing take a few minutes to see the sundial. It’s worth it. And there’s a bench nearby with an engraving explaining how to read the dial and interpret the time. Just beneath the castle was another mill, probably on or close to the existing mill site, owned by the Testard family who had had the lands gifted to them by William the Conqueror, and later in 1295 by Walter de la Poyle whose family retained the lands as part of the Manor of Poyle for a further 600 years. Further downstream beyond Town Bridge the building of three mills for Henry III in 1251, the Kings Mills, created considerable resentment in the town. The extensive development necessitated the creation of a dam which regularly caused flooding in the town and disruption to the upstream mills. 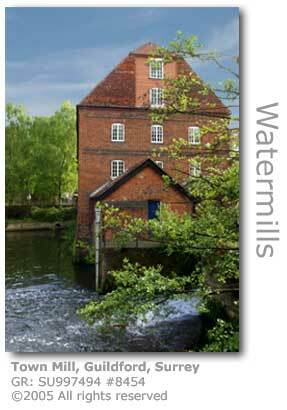 The mills which produced flour, malt and cloth were closed in 1267. There was another mill further upstream at Artington which worked cloth in 1394 and the miller owned tenter frames for drying fulled and dyed cloth at Mill Mead. Artington Mill had disappeared by the Middle Ages. Upper Fulling Mill (GR: SU996490), located where the sluice gates take water off the Godalming Navigation opposite the Guildford Boathouse, was operating by the 14th century taking full advantage of the boom in the Guildford cloth making industry which lasted until the mid 17th century. A steam-powered corn mill was built in Commercial Road in 1858, but was a mistimed venture and failed, the building being taken over 7 years later by the Friary Brewery. 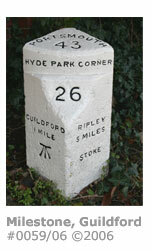 The opening of the Godalming Navigation in 1760 saw a repeat of water supply disputes between the millers and the waterway owners and bargees that had plagued the Wey Navigation for much of the century before. 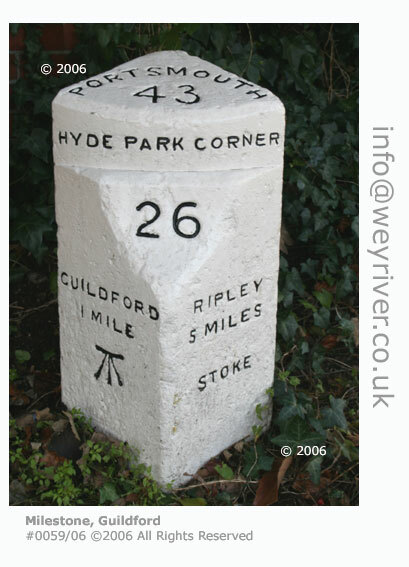 "The river which according to Camden is called the Wey, and which falls into the Thames at Oatlands, is made navigable to this town (Guildford), which adds greatly to its trade." Immediately beyond Town Bridge, which marked the upstream terminus of the Wey Navigation before the Godalming Navigation was to be constructed over a century later, is the Town Wharf (GR: TQ993495) around which much of the industry of the river was centred for centuries. Other wharves flourished along both sides of the river here and such was the level of traffic that in 1794 the town managed to pave the streets through a levy of 1d, the ‘Guildford Penny’, on every load, raising the required £124 12s 6d in less than a year. The wharfingers operating at Town Wharf had the early luxury of a crane that eliminated the need to unload and load cargoes the backbreaking way by hand. Instead the 17th century crane, operated by two men walking a 18 ft (5.5 m) treadwheel housed inside a shed. An additional man was available to assist, usually by preventing the wheel from reversing under load when temporarily idle. The gearing and boom enabled heavy loads to be lifted greatly streamlining operations at the wharf. One claim is that it could be operated by as many as 8 men on the treadwheel to lift up to 3 tons, although this is heavily debated. The crane was operated more or less continuously until 1908 when it was used to unload the concrete piles that had been brought upriver to be used in the construction of the Technical Institute. Now fully restored by the National Trust, the crane is listed as an ancient monument and is only one of three remaining in the country, the others being at Harwich and Kings Lynn. A life-sized sculpture, The Bargeman, stands alongside the treadmill shed. 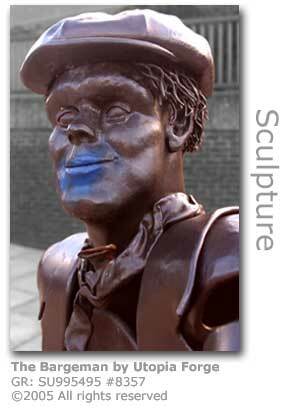 The figure was commissioned by the Guildford Society and created by local blacksmiths Utopia Forge. Carters had an interesting problem in navigating between Town Wharf and upstream of Town Bridge as there was never a towpath here. Simple logic took over as the carter would walk his horse upstream of the barge and then tying the towrope to a piece of wood, would throw this into the river so that the bargee could seize the rope and hitch it to the barge. Town Bridge (GR: SU994494) took its fair share of knocks over its long history, and was for many hundreds of years the only crossing point for the town. In 1763, when the upstream Godalming Navigation was being built, the stone arches of the medieval bridge had to be widened to allow enough room for the barges to pass through. This caused some consternation amongst local townsfolk, with one outspoken member of the community going as far as to say that it was now ‘one of the clumsiest pieces of architecture that ever disgraced a civilized place of residence’. During severe floods in 1900 timber washed down from Moon’s Timber Yard, just upstream where the Debenhams store is now located, severely damaged the bridge requiring that it be completely rebuilt. The iron arched bridge was re-opened in 1902, and after major repairs in 1985 was converted to the pedestrian-only bridge you see today. 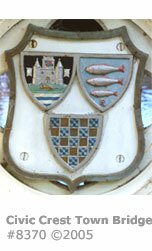 The new bridge proudly displays the Town’s coat of arms. The Onslow Bridge (GR: SU994495) downstream was constructed in 1882 to relieve Town Bridge and enabled a more efficient traffic flow to be created. It was named after Lord Onslow who had funded the project, although a few cynics have pointed out that he was keen to improve the transport route here to benefit the value of the considerable acreage of land his family owned in the town. The River Wey presents a flooding threat to local people and property, especially in areas where building development occurs close to its banks. After heavy rain has fallen across the river's 389 square miles(1,007 km2) catchment area the Environment Agency regularly releases flood warnings and these commonly relate to Guildford. The river last severely burst burst its banks along the town stretch in November 2000 but the extent of the flooding was not as severe as that experienced in September 1968 after heavy and persistent rain fell for the whole of the preceding day. Surrey Police recorded 18 reports of roads and houses having being flooded by 10 am, with a further 53 by noon. The severity of the problem was exacerbated by landslides, collapsed bridges, fallen trees and telephone lines. Evacuation centres were established and additional help was drafted in from across the county which included practical support from the army. 1,800 people were evacuated from their homes and two people lost their lives. The Environment Agency provides fluvial flood warnings and advice with additional support and information provided by Surrey Alert and Guildford Borough Council. Heading downstream the towpath passes opposite the Electric Theatre (GR: SU994496) which is housed in an old electricity generating station. The date of 1913 formed in brick on the facade overlooking the river is when this small generator was added to provide additional supply to suplement that produced by the first power station built in the town in 1896. This extension proved highly unreliable and was taken over by Guildford Corporation in 1921. The modern theatre was built within the converted building in the 1990s by Guildford Borough Council, and as well as providing a public venue for amateur groups it also acts as an arts and community centre. Open to the public it is well worth a visit. In Bridge Street alongside the River Wey is evidence of the modern face of an organisation that was formed in 1884. The YMCA movement has had a presence in Guildford for over 125 years and today this is very visible in the form of the modern Y Centre (GR: SU994495). From this thriving building the Christian principals of its founder George Morris live on with the Guildford Young Men's Christian Association providing not just affordable hotel accommodation to members but also a helping hand for young people through the organisation's activities and schemes. At the end of the 19th century the organisation met in the Congregational Chapel which became known as Mission Hall in Chapel Street, now a restaurant. The Guildford YMCA moved to various premises over the next century including addresses in the High Street, Woodbridge Road and North Street. As well as the Y Centre the YMCA also operates from premises in Wharf Road and the Plantation Cafe in Market Street. A national property development company, has been granted planning permission (October 2010) for a new office block to be built on the banks of the River Wey (GR:SU993499) on Mary Road between Dapdune Wharf and the Crown Court buildings. The development, called Greenwey, will provide ' flexible' office space totalling 35,000 square feet (3,250 sqm) in a three-storey block with river-facing units enjoying balcony access. The Wilkey Group have said that the design is 'sustainable', with the aim of using natural light and ventilation, and that the building will feature brick, render and timber combined with 'distinctive frontages'. 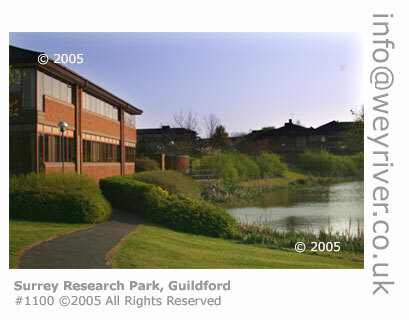 The initial application was submitted in October 2009, at which time the Guildford Society did not object but requested that a three metre (10ft) wide strip of land would be made available alongside the riverbank for public access. Subsequent plans have not included any space for a riverside park or pathway. "We realised that that was quite a difficult request, it would have been very nice to do but I think we did more in hope than expectation," said John Bayliss, chairman of the planning group, Guildford Society. "It was to make a point. 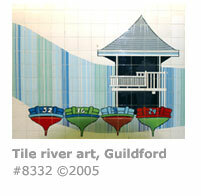 The riverside is important to Guildford, the special thing about Guildford is that it has a river running through it. There is a path on the other side of course, but it would be nice to have one on the Dapdune Wharf side as well, that is what we thought about." "Flexible office space will be offered to the occupier and external balconies will ensure maximum enjoyment of this riverside environment," said Derek Gordon, director, sales agents Kingstons. "It is the only significant new build site in central Guildford under 40,000 square feet with planning consent to enable a start straight away." On the east bank of the river is Dapdune Wharf (GR: SU993503). Fully renovated by the National Trust the wharf, open to the public, was the site of all of the major barge building for the Wey Navigations. Three generations of the Stevens boat building family operated their thriving business here which included building and owning barges, running a barge hauling business and managing both the Wey Navigation and the Godalming Navigation. It was Harry Stevens that donated the Wey Navigation to the National Trust in 1964. The family had owned the Navigation since 1902. The wharf only ceased the manufacture of barges in 1946. There has been a wharf here since the beginning of the Wey Navigation in the 1650s. The wharf prospered after the Great Fire of London in 1666 which triggered a huge demand for timber to rebuild the capital. The Reliance, one of the original barges to be built here in 1931-32, has been dry-docked and its huge hulk can be explored by visitors. The barge was repaired and refurbished in 2008 by The National Trust using traditional materials including chalico which is a molten mix of coal tar and pitch bulked out by dried horse manure. 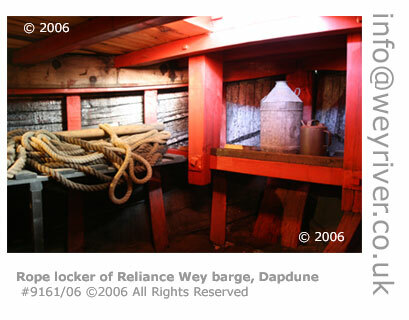 Measuring 72 ft (22 m) and with a beam of 13 ft (4 m) The Reliance was typical of many of the Wey barges in being able to carry cargoes of 60 – 80 tonnes. Alongside the barge are two of the original capstans that were used to haul barges out of the water onto the graving dock where repairs were made. Moored close by is another barge Perserverance IV which was built at Dapdune in 1934-37 and is owned by the Museum of London. Eleven of these Wey barges were built here. 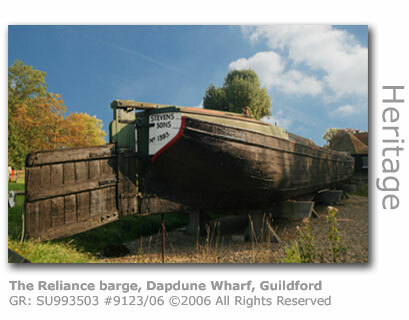 Wey barges are flat-bottomed boats designed to fit the narrow locks and shallow waters of the Wey. They were all fitted with a large hinged rudder which allowed it to be folded back when inside a lock. This enabled larger hulls to be built to maximise cargo space in the hold. Most could carry up to 80 tonnes and plied their trade along the Thames and up the river as far as Coxes Mill just south of Weybridge. The river above Coxes was shallower and smaller barges were built with a 50 tonne capacity which enabled access as far as Guildford. The 4 mile run along the Godalming Navigation required smaller barges still. Hauled by horse or bow-haulers, men working in teams towing by hand, the barges were manned by a captain and one or two men. The original barge building shed now houses workshops and an education centre for visiting school groups. Elsewhere on the Wharf original buildings have been restored to show how Dapdune functioned in its heyday. 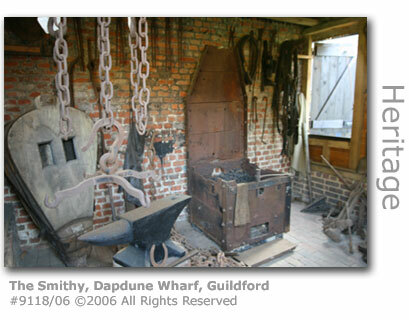 The Smithy, where the great iron nails used to nail the barges together were made, has been reconstructed and contains a forge and large bellows. Alongside is an original tar chest in which tar was stored after it had been mixed with coarse fibre such as goat's hair or hemp prior to being used to seal the gaps between the planks of a barge to make it watertight. Caulking was a skilled task as it required the tar to be heated to provide exactly the right consistency for it to be worked into the cracks often no more than a millimetre wide. The steam chest was used for heating the oak planks to make the wood pliable so that it could be bent and twisted into shape. This is a smaller chest than that used to steam the huge timbers needed to make a new barge. The Barge Repair Shed provides shelter over a stretch of water into which boats requiring repair above the waterline were moored. Barges requiring more extensive work were hauled onto the graving dock where Reliance now stands. The Stable is one of a number that were originally on the site and housed cart horses that were used for making local deliveries. This building was later converted to house the boiler used to power the steam chest. The boiler has been preserved and is on display. The visitor centre housed in the Carbide Store tells the story of the two Navigations and the people who lived and worked on them through an interactive exhibition. The hand operated crane in front of the building was installed in 1935 for unloading carbide and the rails on which it sits used to run along the whole frontage of the wharf. The Gunpowder Store is part of the oldest building on the Wharf having been built in the mid-17th century. It's original use was the storing of gunpowder shipped downriver from the Chilworth gunpowder mills. When Chilworth ceased gunpowder production the building was used as a store for paint, ropes and sheets. The cottages on the Wharf housed the families of the owners and managers. Wharf Cottage was built in 1894 for the Edwards family who moved to Dapdune from the Kennet & Avon Canal to build and repair Wey barges. Edwin Edwards was a master carpenter who after his death in 1904 was superceded by his four sons who continued to build Wey barges. Dapdune Lea was built in the same year for the Stevens family and today houses the National Trust's Navigation Office. The Trust provides trips on an electric launch from Dapdune Wharf. 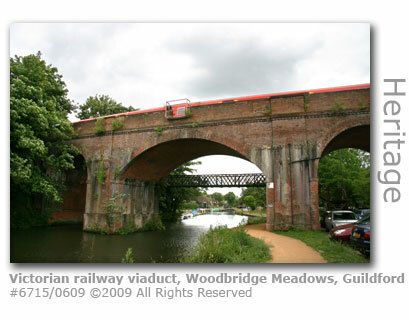 The towering brick railway viaduct (GR: SU 993504) downstream of Dapdune Wharf was built in 1885 by the London and South Western Railway to carry the line in from Hampton Court and represents Guildford’s first example of significant railway architecture. It is known locally as 'the seven arches'. Heading towards Woodbridge, the Navigation still sharing the original course of the river had to be altered twice in modern times. 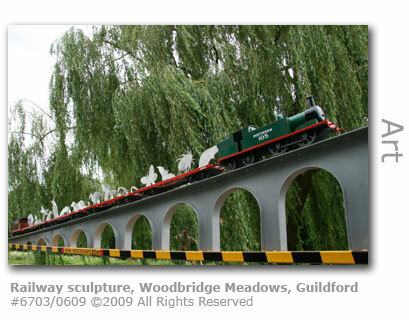 The first course change was in 1856 when the Woking railway reached Guildford necessitating extensive bank work where it now skirts the river. The coming of the Guildford By-pass which carries the A3 across the river and along its banks for a few miles needed the stretch by Woodbridge to be straightened. The towpath is interrupted at the first road bridge (GR: SU991508) carrying the original main road, and necessitates climbing up to the bridge and crossing over the busy road to rejoin the towpath on the other side, now also on the opposing bank. The modern bridge at Woodbridge was constructed in 1913 and had to be strengthened in 1990 to allow for the vast increase in traffic it was having to carry. The open area upstream by the bridge is known as Woodbridge Meadows (GR: SU994512). There was once a wooden bridge here hence the name, although it was rebuilt in 1913 by Surrey County Council in order to take the weight of traction engines and lorries. Guildford Borough’s main power station was fuelled with coal shipped in by barge and power was generated here from 1928 to 1968. All that remains today are the concrete walls of the cooling-water intakes. A reminder of the historic bridge stands in the form of The Wooden Bridge public house, a large 1930s style building today standing close to the busy A3 overpass. The pub was closely linked to the early history of rock music in Britain when it was chosen as a venue by Ricky-Tick, a company running a chain of popular clubs in the 1960s. The club hired the Wooden Bridge's ballroom for it's inaugural gig featuring The Rolling Stones in March 1963. "Opening night at the Wooden Bridge, Guildford. The Rolling Stones had established a fantastic and fanatical following within a very short time. Many of their fans would travel to two or three gigs a week. Philip [Hayward, co-promoter with John Mansfield] arrived at the pub about 7pm to find the car park crammed full of Stones fans. "Philip had recruited three new bouncers to work at Guildford. He quickly instructed them to open the back doors and for one of them to assist the Stones to unload their equipment. Then the bouncers had to secure all the doors and windows, so that the fans could not get in without paying. This would be highly illegal today and rightly so. "Within a very short time the ballroom was packed. Once the Stones started playing the response was predictable. The fans were foot stompin’, hand waving, and girls were perched on other people’s shoulders. "There were hundreds of fans locked outside. Suddenly, fire doors were ripped open and all these people started to pour in. The newly recruited bouncers had a struggle to maintain order, which they did with good humour and without resorting to violence. 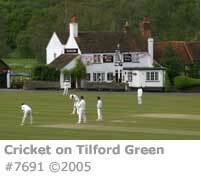 Ricky-Tick hired other venues in the area including Merrow Village Hall, and Worplesdon Village Hall where the Stones were also to play in August 1963 but failed to turn up having chosen to commit instead to a TV appearance on Ready Steady Go. The Beatles played at Ricky-Tick venues in Guildford the same year. The GSA Conservatoire (formerly the Guildford School of Acting), a drama school of international repute that has trained a good many British actors, was planning to build a new state-of-the-art centre on Woodbridge Meadows. Under agreement with Guildford Borough Council, the land was to be leased for £15,000 per year on a 150-year lease and the new £22m school opened in 2008. However following a £3m grant from the Higher Education Funding Council for England (1) the school is to be built on Surrey University's campus. The meadows will now be built over with a self-storage facility after the council sold the land in a £5.6m deal. Reaching The Rowbarge public house (GR: SU997512) in Riverside on the opposite bank to the towpath you have reached the start of the original experimental cut of the canal started in 1618 for Sir Richard Weston’s agricultural improvements through controlled irrigation. Weston retained only half a mile of this original cut for his Wey Navigation which was to be built some years later. The abandoned section eventually became in-filled and lost. The section of canal upstream as far as Town Wharf was cut in 1650. the small Leggs Island just upstream was created in the 1930s Improvement Scheme. The strip of land trying its best to provide a little serenity by acting as a buffer between the industrial estate with its busy Walnut Tree Close service road and the river is in Woodbridge Meadows (GR: SU991506). Before land development in this part of the town there was an extensive water meadows along this stretch of the river but this has long since been lost. The local council and environment groups have tried to give the riverbank here some normality again through some imaginative landscaping and art projects, although they will never overcome the noise and visual intrusion imposed by such an industrious area. 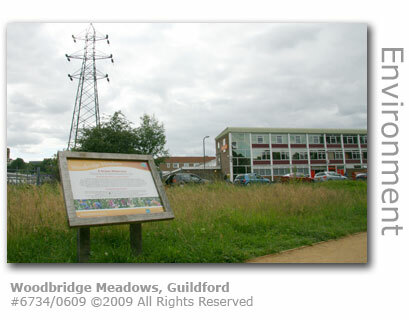 All of the land described as Woodbridge Meadows covers 6 hectares which includes the industrial estate and open areas and is owned by Guildford Borough Council, with the exception of a small plot at the southern end owned by Thames Water for water extraction. 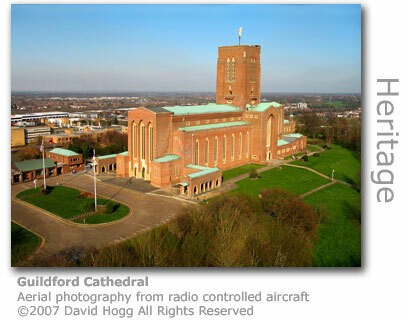 The site is delineated by the Woodbridge Road (A25) to the north, the Guildford via Cobham railway embankment to the south, the London to Portsmouth main line railway to the west and the River Wey frontage to the east. 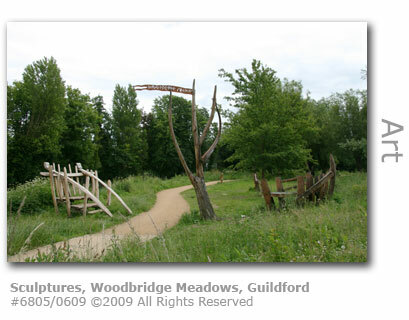 As part of a re-development plan devised in 2004 the council’s vision is to ‘create a high quality work environment for those employed at Woodbridge Meadows, and a worthy piece of townscape that constitutes a good place to visit and pass through’, and want to attract development to enhance the area. The land immediately adjacent to the river was in 1607 documented as The Lees Meadow and formed part of Lodge Farm, which owned many of the adjacent fields that have long since been built over. Lees Meadow survived the building of the Victorian viaduct and Woodbridge Park (now Wickes) but its appearance as a meadow had long since changed as trees were planted and became established. 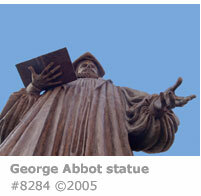 However the first indication that something has changed are the sculptures that have been created here. As part of a project to restore the meadow many of the trees were felled and their stumps or fallen logs were used for wood carvings. The land is also being managed to prevent re-growth of the trees with tall grasses and other plants being cut after the many wildflowers that have taken root have flowered. The meadow is now becoming an increasingly diverse wildlife habitat with populations of birds, insects, mice and grass shrews having established themselves here. Plants include buttercups, purple knapweed, birds-foot trefoil and blue speedwells. Under the guidance of Adam Owen, the Trees and Countryside Manager for the council, a team of wood carvers the Treepirates spent six weeks in 2008 creating over 20 pieces of artwork from the tree stumps and logs left over from the clearance work. These include giant feet, Herne the Hunter, a dragonfly, elfin faces carved high up in the trees and a shipwreck. In the small pay-and-display car park in the shadow of the towering railway viaduct a local sculptor has created an imaginative touch to the mundane height barrier that guards its entrance. Richard Farrington has installed a replica viaduct railway across the barrier complete with a scale replica of a Drummond 7 engine (1), double bogie wagons and a brake van. The steel sculpture, which took eight weeks to complete and measures 18 feet (5.4m) in length and weighs 440lbs (200kg), was funded by Rushmon Homes as part of an initiative established by local planners to have property developers provide financial support for community projects as part of their commitment to the area. At the northern edge of Woodbridge Meadows is a landscaped open area with a footpath running through it wedged between the busy Woodbridge Road, hotel, car showrooms and the river. 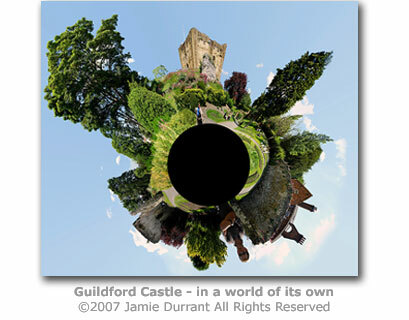 In 2008 Guildford Borough Council announced its intention to launch a project here to ‘enhance this area further by working with an artist and the public to design public art, which will include an element of contemporary art’. The project will allow for an open competition to select the artist and also to discuss ideas with local residents, employees and businesses. The council want the artwork to become a local landmark and for it to highlight and complement the River Wey. 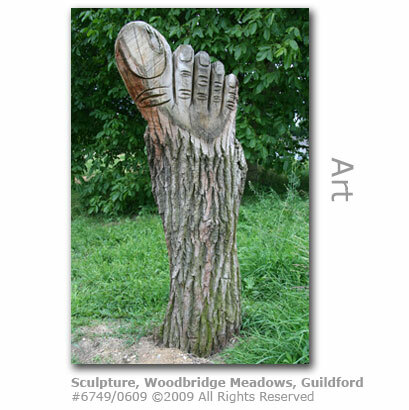 Like the other art projects throughout Woodbridge Meadows the piece will be funded by local private building projects. (1) The Drummond 7 was a railway engine used extensively across the Southern Railway network prior to the introduction of diesel and electric trains. There were once allotment gardens further upstream from Woodbridge Meadows in Walnut Tree Close adjacent to the Billings print works, now converted to riverside offices, and lay alongside a pair of red brick flat roofed air raid shelters. Immediately downstream of the 1926 Stoke Bridge carrying the busy A320 between Guildford and Woking is Stoke Mill (GR: SU998510). The bridge has a double span straddling both the Navigation and the cut, the latter carrying the Wey proper by the mill which continues on a short meander before rejoining the canal a little downstream. 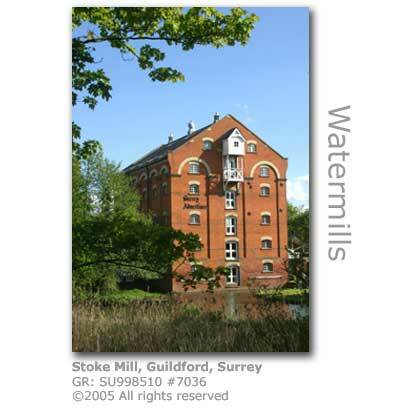 Having been constructed in 1879 Stoke Mill doesn’t have the long history associated with most mills along the Wey, although somewhere near here was the first mill built by Weston in 1635. A single storey mill building alongside dates from 1863. Milling primarily corn and paper, the miller here was one of many that found himself in regular dispute with the owners of the waterway and the barges that plied their trade along it. All mills need a constant supply of water, and a mill of this size had especially urgent requirements. The continual lock operations along the busy Navigation would create merry havoc with water levels in the eyes of the miller, and the canal operators would see the huge consumption of water taken by the mill as a continual threat of grounding vessels. Court actions were frequent and in 1832 the millers at Stoke, Newark and Woking agreed to a ‘Millers Indenture’ which formalised working practices for all parties with a need to use water along the Wey. The millers at Weybridge followed suit in 1849. Mills that predated the building of the Navigation had different rights awarded them and they could expect to receive payment from the bargees for the use of the water in compensation for any disruption. Stoke Mill has been converted to modern use and is today occupied by the Surrey Advertiser group of newspapers. There is a house with parts dating back to 1650 close by, which may have been a mill house associated with Weston’s Mill although major refurbishments in Victorian times have hidden much of the features. The Surrey Probation Service has for four years successfully put young and adult offenders to work along the River Wey undertaking unpaid work in vegetation clearance, coppicing and towpath maintenance. Offenders who have been ordered by the courts to complete unpaid work are ferried to and from work sites by the Guildford based Swingbridge boat during the winter months. Working alongside volunteers and trained supervisors the offenders have proven to make a valuable contribution to environmental and conservation work. 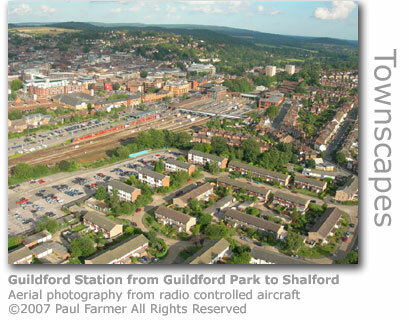 The scheme is managed for the Probation Service by Surrey Care Trust in conjunction with Guildford Borough Council. "A large part of the success of this project is the trust and respect between the offenders and volunteers," said Surrey Care Trust project manager Margaret Reeder. "We identify what each person is good at and get them working on that. For example, we have one offender who said he was a skilled tree surgeon so we have made use of his skills." The work for offenders is hard and labour-intensive but most seem to enjoy having made a contribution to a worthwhile scheme. "We get everyone from city traders to repeat offenders completing unpaid work for committing offences ranging from minor motoring offences to more serious crimes such as burglary," said James Whittle, manager of community punishment and unpaid work in Surrey. "Some of them work six days a week and then spend their day off completing unpaid work. It is not easy and certainly not a soft option. From what I have seen, it is less likely someone will re-offend if they are given unpaid work as a punishment than if they had gone to prison." In 2005 offenders served their community orders in Riverside Park cutting back willow trees and shrub which could dry out this wetland area if allowed to colonise unchecked. Current (November 2006) projects include clearance work at Stoke Lock. 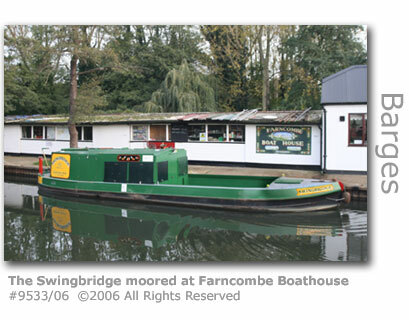 In the summer of 2006 The Swingbridge, which is helped by a donation of £50,000 by Thames Water towards its running costs, became a pleasure craft. 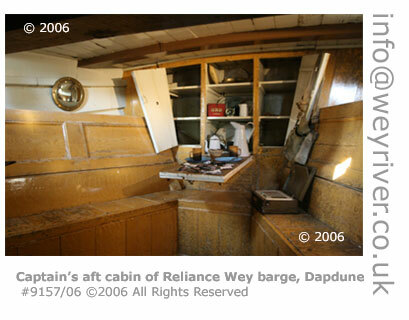 In 2004 the boat launched popular boat trips for the area's most vulnerable residents. The boat has a wheelchair lift which provides access for people with mobility problems who wouldn’t otherwise experience the pleasure of seeing the Wey Valley from the river. Swingbridge provided nearly 200 trips for community groups during 2007. The Heritage Lottery Fund announced (September 2007) that the Surrey Care Trust will receive £50,000 to go towards The Swingbridge running costs. Funding for an additional £30,000 to go towards the construction of another boat was also in the pipeline. Once the second boat is operational the Trust will be able to use one for education and training of offenders all year round with the second freed up for community boat trips. The charity, which celebrates its 25th anniversary in 2007, worked with 70 offenders last winter. Swingbridge 2 was formally launched in July 2008 by TV presenter Charlie Dimmock and has been assigned for conservation work manned by Trust volunteers and offenders on unpaid work. Swingbridge 2, which was funded by £30,000 from Thames Water, Woking Borough Council and the Thames Heritage Trust, provides facilities including a kitchen, toilet and space for tools and clearing equipment.